The late President George H.W. Bush epitomized what is known as the “servant leader.” Whatever anyone thought of his positions on various issues, one could never question his lifetime of commitment to service. He was not alone in this commitment. 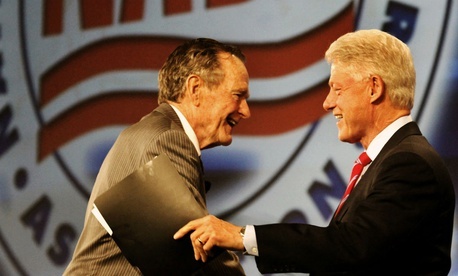 Much has been written about Bush 41’s post-White House friendship and partnership with President Bill Clinton, under whose leadership Americorps and the Corporation for National and Community Service were born. President Jimmy Carter’s commitment to Habitat for Humanity embodies the ethos of service. And during Thanksgiving week, pictures of former President Obama chipping in at a Chicago food bank spread across the internet. There was nothing unusual about it; he and his family frequently have been seen doing volunteer service, while he was in office and since. Ditto for President George W. Bush. But I have been struck over the last two years by the near absence of any similar images of, or messages from, President Trump or, for that matter, any members of his family or administration. Yes, there was the brief Thanksgiving visit to a military base near Mar-A-Lago. But unlike virtually every President in recent history, there has been no engagement of real meaning, no messages or leadership that conveys the value and importance of giving back and its centrality to the American experience. In the nearly two years since his inauguration, there have been two Martin Luther King Days of Service and two 9/11 Days of Remembrance and Service (both are officially designated as such), and the President has chosen to essentially ignore the service component. With few exceptions, the same is true for senior members of his administration. This too is a stark departure from each of the last several administrations. And it matters. It matters because we are living in a time of such greatly diminished civility, painful divisions and a sharply reduced sense of shared national purpose. It matters because decades of data document that civic engagement, through voluntarism and service of all kinds, can serve as a great unifying force; as a critical foundation that enables a community to function effectively amidst a wide array of political, social, economic, ethnic and other differences. And it matters most because the national tone is set from the top. More than 70 years ago, historian Arthur Schlesinger insightfully observed that voluntary organizations represent our “greatest school for self government.” Those who help lead such organizations he wrote, “have been trained from youth to take common counsel, choose leaders, harmonize differences, and obey the expressed will of the majority. In mastering the associative way, they have mastered the democratic way.” Nearly 20 years ago, Robert Putnam’s extraordinary book Bowling Alone reiterated the essence of Schlesinger’s message and opened our eyes to the dangers of decreasing civic engagement. Yet, as Yoni Applebaum recently pointed out in The Atlantic, recent trends, most pre-dating the Trump administration, are cause for deep concern. In fact, while participation in voluntary organizations has been relatively steady, by 2010 only 1 in 10 Americans had served as a leader of such a group. Therefore, it probably shouldn’t be a surprise that polls taken just a few years ago showed that fully 25 percent of millennials questioned whether democracy was a good way to run a government. In a similar vein, it is notable that in the heat of the 2008 campaign, both Barack Obama and John McCain took a night off to participate in a nationally televised forum on the importance and value of public service, voluntarism and civic engagement. When I asked a senior Clinton campaign official why the topic had not come up again in 2016, he said that it just didn’t resonate in the polls. How sad is that? So yes, it does matter that the President and his administration have been AWOL on the subject. And it matters that recent GOP budgets have consistently called for the complete elimination of the Corporation for National and Community Service, which, in addition to overseeing AmeriCorps and Senior Corps, provides essential support and leadership to scores of service organizations across the nation. This is not a partisan political issue. Regardless of political persuasion, just about everyone I know shares a deep concern about the nasty nature of today’s public discourse, the inability to thoughtfully and respectfully discuss or debate, let alone compromise on often complex issues, and the overall breakdown of civility. The reasons for this are many and not all are recent. But as Schlesinger so cogently observed, incentivizing and growing a culture of volunteerism and volunteer leadership, is an indispensable tool in building and enhancing effective communities, democratic institutions, and democracy itself. This was core to President H.W. Bush’s ethos, as it has been to other presidents. In that light, expanding the government’s leadership in national and community service needs to take on a renewed, critical urgency. And it is in that light that the absence of presidential leadership and action in promoting and enabling a culture of service, of shared purpose, matters. It matters a lot. And rarely has it been needed more.